Migraine has been defined as a common disabling primary headache disorder. 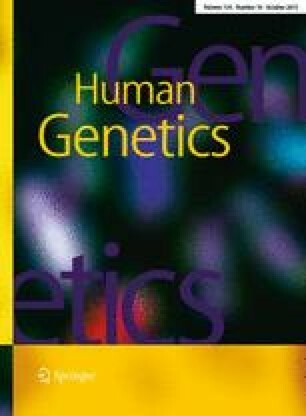 Epidemiology studies have provided with the undeniable evidence of genetic components as active players in the development of the disease under a polygenic model in which multiple risk alleles exert modest individual effects. Our objective was to test the contribution of a polygenic effect to migraine risk in the Norfolk Island population using a panel of SNPs reported to be disease associated in published migraine GWAS. We also investigated whether individual SNPs were associated with gene expression levels measured in whole blood. Polygenic scores were calculated in a total of 285 related individuals (74 cases, 211 controls) from the Norfolk Island using 51 SNPs previously reported to be associated with migraine in published GWAS. The association between polygenic score and migraine case–control status was tested using logistic regression. Results indicate that a migraine polygenic risk score was associated with migraine case–control status in this population (P = 0.016). This supports the hypothesis that multiple SNPs with weak effects collectively contribute to migraine risk in this population. Amongst the SNPs included in the polygenic model, four were associated with the expression of the USMG5 gene, including rs171251 (P = 0.012). Results from this study provide evidence for a polygenic contribution to migraine risk in an isolated population and highlight specific SNPs that regulate the expression of USMG5, a gene critical for mitochondrial function. A. J. Rodriguez-Acevedo and M. A. Ferreira are co-first authors and contributed equally to this work. The online version of this article (doi: 10.1007/s00439-015-1587-9) contains supplementary material, which is available to authorized users. This research was supported by funding from a National Health and Medical Research Council of Australia project grant. A.J.R.A was supported by a QUT Postgraduate Research Award (QUTPRA) and the Australian Postgraduate Award (APA) Scholarships. M.C.B. was supported by a Corbett Postgraduate Research Scholarship, and R.A.L. was partially supported by a Corbett Research and a Griffith University Areas of Strategic Investment for Chronic Disease Fellowship.